Lightweight yet durable gold anodized aluminum extrusion design holds up to 100 lbs. Hinged chart holders at various heights for optimum display of materials, fold out of the way when not in use. May also be used for paper pad flip chart presentations with GripQuick Chart Clamp. Included with Model D-305. All models fold flat for easy transport and weigh less than 8 lbs. 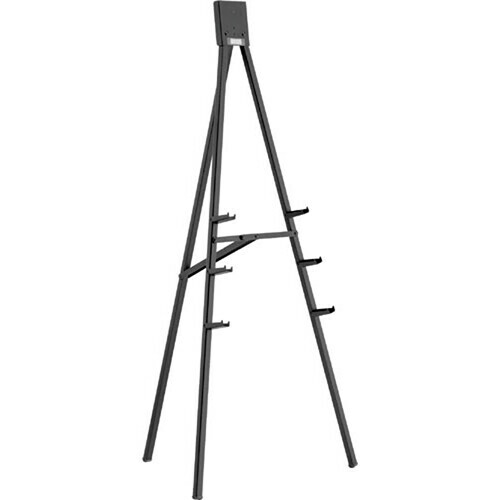 Choice of two sizes: Model H-323 and D-305 stand 6' high and Model H-321 stands 5' high. Box Dimensions (LxWxH) 65.0 x 7.0 x 2.5"
Dual Purpose Easels, Black Powder Coated is rated 5.0 out of 5 by 1. Rated 5 out of 5 by cindy o. from For the star of the show! This easel is an excellent way to display that special piece of artwork at a gallery show! I know it can be used for presentations, and I will take advantage of it's sturdiness and sleekness for that use as well. It is lightweight and easy to set up...that makes it just about perfect!